The In-Discreet is a clip-in version of our Endless Summer Special. Instead of straps, it uses a spring-steel clip. It rides 3/4 inch deeper than the Endless Summer Special, but not quite as deep as the Appendix IWB. However, it can be made for larger guns than the Appendix IWB, which is only made for subcompacts. These can be made for most small to mid-sized pistols. -- lightweight construction for less bulk. -- a stitched-in sight track. -- a steel band in the throat for adjustable retention and easy reholstering. -- a leather guard to keep the hammer and spur from biting into your side. -- instant mounting and dismounting from the waistband using a spring-steel clip. 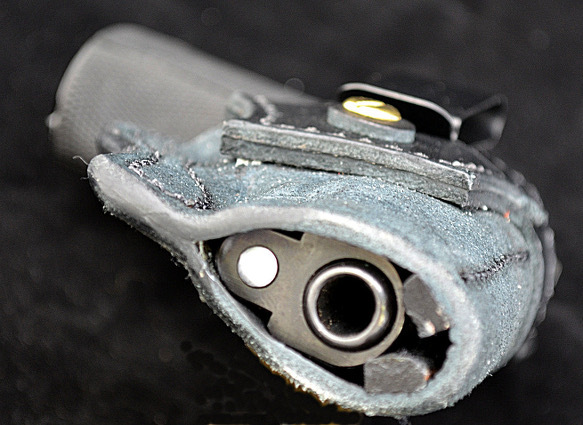 -- a deep ride inside the waistband that hides your pistol from prying eyes. 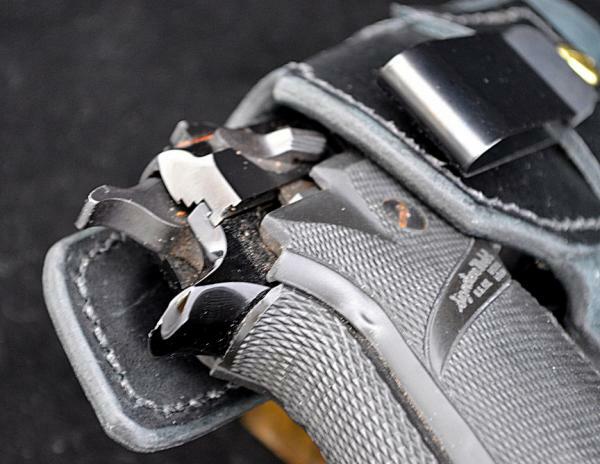 -- an open cut to ensure that you can get a proper, complete grip right from the start. -- custom molded to fit the specific model of gun like a glove. 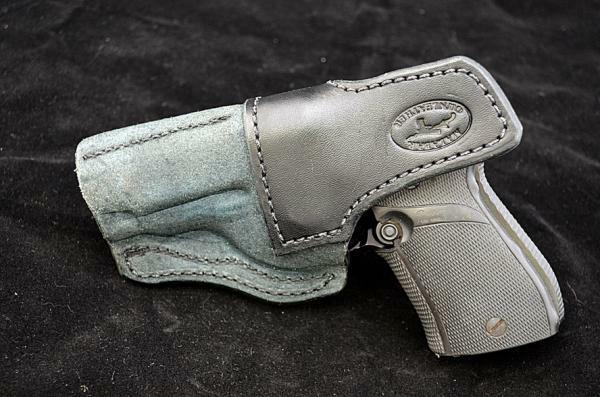 The standard cut of this holster is for a 1.5" belt. If you intend to wear it with a different size belt, please let us know. Remember: If you're going to wear an IWB holster, you need to have your belt and pants 1-2" wider to accommodate the extra bulk. 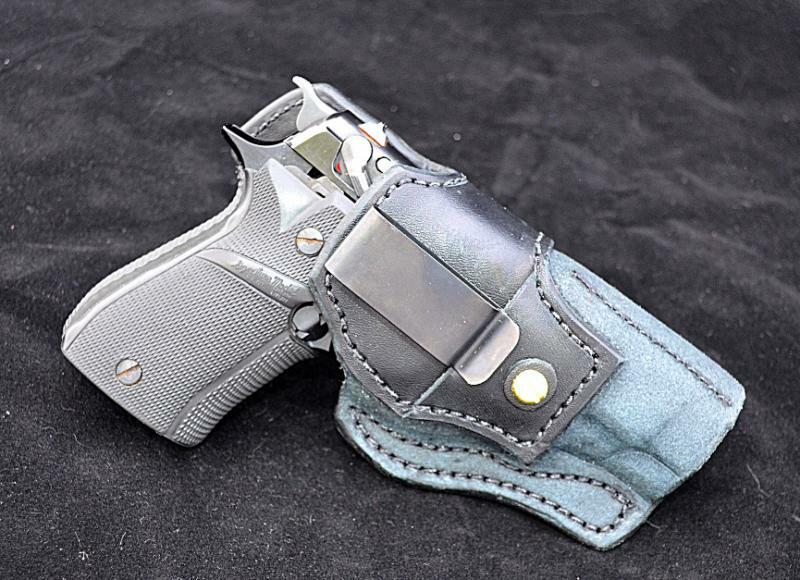 This holster can be made with cant or a straight drop. Pricing: $85 in black, russet or natural cowhide; $95 in natural tan horsehide.